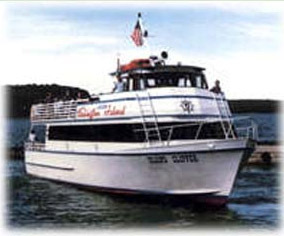 The Island Clipper departs Gills Rock at the tip of the Door Peninsula and carries visitors through island-studded waters to picturesque Washington Island. The 65 ft., 149 seat all-weather craft, with the latest in safety and navigational equipment, makes the seven mile, 20 minute trip relaxing and enjoyable with comfort seating and narration of your voyage through Deaths Door. Once youre on the Island, take a guided 90-minute tour. The Viking Train stops at four points of interest.